This is a perfect size for keeping with you at all times since it's so compact. One of the purest and most powerful sprays available. This is a perfect size for keeping with you at all times since it's so compact. Attach it to your keychain so you'll always have it with you. One of the purest and most powerful sprays available. Law enforcement strength! WildFire pepper spray is an inflammatory agent. It will induce coughing, choking and nausea, as well as dilating the eye capillaries resulting in temporary blindness. The mucous membranes will swell to prevent all but life support breathing causing the assailant to be temporarily incapacitated. A one second burst of WildFire small pepper spray will stop an attacker for up to 45 minutes without causing permanent damage. Wildfire is an improved formula that reacts quickly and effectively to disable any assailant. 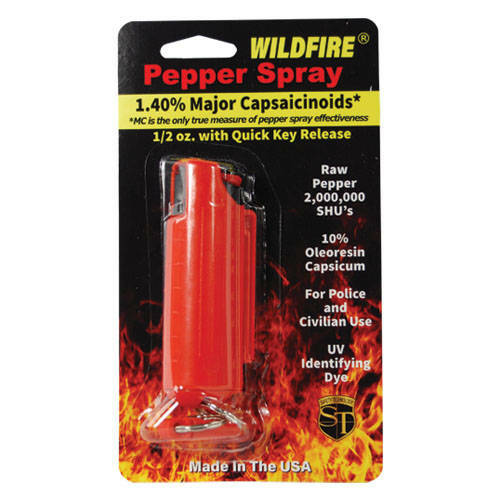 The WILDFIRE® PEPPER SPRAY is hot, hot, hot. The Major Capsaicinoids are the true heat measure and WildFire has the hottest on the market at 1.4% Major Capsaicinoids. Wildfire 1/2 oz. Pepper Spray has a range of 6-8 feet and comes with a hard case. Each unit provides 6-10 one-second bursts and comes with a quick key release keychain, and safety lock. 3 ½" x 1 ½"
There are many advantages that come with using this small pepper spray. It can be used at a safe distance. By stretching out your arm and aiming at the assailant before they get too close, you are able to stop them. This spray works at a distance of 6 to 8 feet. They are quite affordable. You do not have to worry about the cost by purchasing one. Most anyone is able to afford to protect themselves. Are simple and easy to use. All that needs to be done is to aim accurately for the eyes and press the trigger. Self defense sprays are very effective and begin to work immediately. You don't have to worry about possible consequences of permanently hurting someone as you protect yourself. The effects of the OC are temporary and only last for up to 45 minutes. Pepper sprays are used by police forces all over the country as an alternative to blunt force to subdue criminals that do not want to cooperate. The severe burning sensation that this product creates is certainly not pleasant, but it prevents a police officer from having to use a nightstick to a criminal’s head or legs. The police in almost every state are allowed to carry one. One of the reasons that many people prefer this self defense option is because it can be used at a distance. That makes it easier to use than something like a stun gun or any other stun device because a stun device requires close quarters to be effective. You can get sprays that allows you to defend yourself from several feet away. It is important to be certain that you want to use the spray on a person before you actually press the trigger. The effects of the spray are immediate and painful. You do not want to hit a friendly target with a substance like this. In order to get the maximum effects, it should be directed at the assailant’s face. The most painful initial spot of impact is the eyes. But be aware that the intense pain can be extensive, (which is what you're after). Another place it will hit is the person’s nose and mouth. The spray will start to take effect immediately and will completely incapacitate the assailant long enough for you to leave the area. Contrary to popular belief, the effects are not permanent. The effects are instantaneous and temporary, but they can be extremely painful for several minutes. If you are looking for a device that will offer you protection without having to get into actual contact with your assailant, then a small pepper spray is an ideal solution. It is a powerful chemical that will render a criminal incapacitated and allow you the time that you need to escape. I am very happy with the service, I bought the product and gave them to two of the girls that close up at nite for protection when they are all alone. I left the information with the officers of the club hoping they would purchase more for all the people that close up at nite.